Updated and expanded entries and exits to the parking garages and economy lots are under construction at the Austin airport. A new jet blast fence and additional apron space is completed as part of the 9-gate terminal expansion project. New airport robotic coffee barista debuts across from Gate 8. 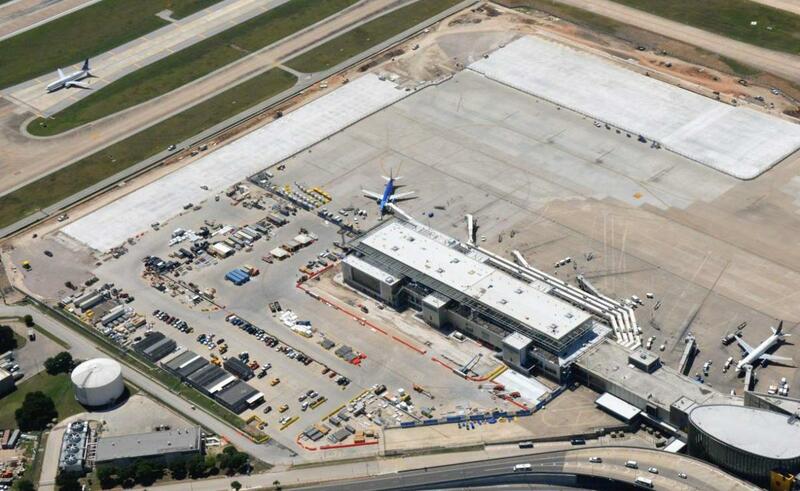 Construction has started on renovating and enlarging the entry and exit parking plazas at the Austin airport. This is to provide better clarity and convenience for customers and to make parking operations more efficient for the parking garages and economy lots B-G. The north exit plaza that services all of the economy parking lots and the new 6,000 space parking garage currently under construction, will expand from five lanes to 10 lanes. This is also the location of a new parking administration building at the airport. A new entry to the rental car facility is under construction and a new entry to the parking garages will expand from four lanes to six lanes. The new entry plaza for economy parking is under construction. It will continue to be four lanes and accessible from Presidental Blvd. Mounted on top of a new retaining wall at the end of the newly expanded east apron at the Austin airport is a new 14-foot high jet blast fence. A jet blast fence deflects fast moving heated air created by jet engines. This protects airport assets and personnel from potential damage that could occur from the jet blast or airborne debris. The fence, fabricated by Empire Acoustical Systems and constructed by lead contractor Hensel Phelps, is 370 liner square feet in length and 18 inches wide. 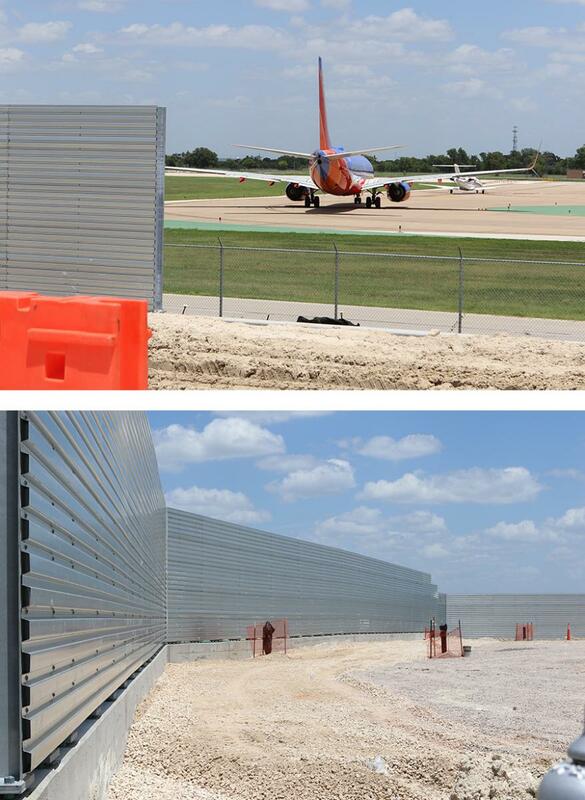 The fence is a new addition to the Austin airport east apron as part of the 9 gate terminal expansion project. Currently, the expansion of the east apron is adding another 59,000 square yards of operational space to the Barbara Jordan Terminal apron as part of the 9 gate terminal expansion project. This will allow and provide space for more and larger aircraft movement and operations to service the new 9-gates currently under construction. The east apron expansion will increase the number of overnight aircraft parking (RON) to approximately 31 positions, pending aircraft size. Additionally, the number of gate positions available at the Austin airport will increase from 24 to 33. Hensel Phelps, the lead contractor of the expansion project estimates that 57,000 tons of pavement, that is 16.5 inches thick, has been poured for the apron to date. 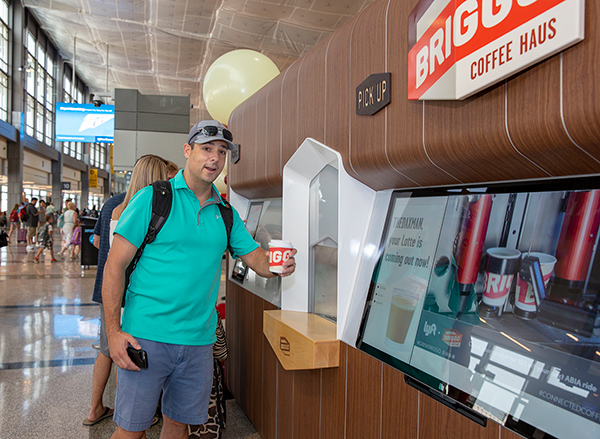 Briggo has completed construction and installation of the world’s first app-based automated coffee barista, located across from Gate 8 at the Austin airport. Now open, this is the first robotic, 24/7 specialty coffee system installed in an airport in the world. The haus allows travelers, airline crews, and airport employees to customize their coffee, hot chocolate or tea order remotely from the app or directly at the nearly 11-feet wide, 8-feet tall and 4-feet deep machine. Beans are ground inside the machine that is flanked by two large touch screens and dairy, sweeteners and flavors are added per the customer's selections. Learn more at www.briggo.com.